These American flag money clips can be made just as the sample picture or can also be custom made with American flag designs or national symbols. Just let us know which you would like by sending us an email to anleng56@yahoo.com upon purchasing. You can also attach photos if you are looking to custom make the money clip. The back of the clip can also be engraved with up to 3 lines of engraving. Makes a unique and memorable gift. Picture perfect for holidays, birthdays, Father's Day, weddings and all occasion. 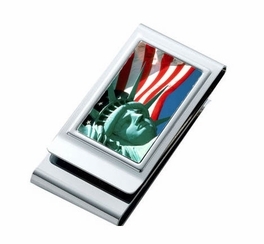 This handsome money clip is the perfect accessory to replace that bulky wallet weight down your pocket. Slim and lightweight, silver plated metal engravable. Holds bills and cards.